You know the feeling when your lips are so dry that they feel tight and pulling? Well, you don’t have to put up with dry lips anymore, thanks to Maybelline New York’s latest lip revolution. 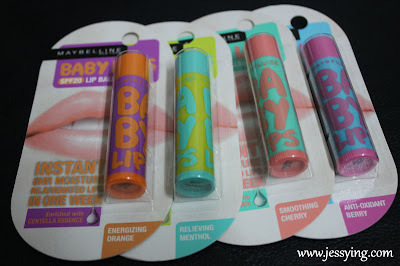 Maybelline New York Baby Lips promises to get your lips feeling soft, hydrated and smooth – much like baby lips! I have 4 flavours in my hands and there are Energizing Orange, Relieving Mentol, Smoothing Cherry and Anti-Oxidant Berry. So from the names, you can roughly guess the scent of the lipbalm and what are the benefits. Oh I love the colourful & cute packaging, very eye-catching! I read that in just one application, Baby Lips instantly moisturizes for up to 8 hours. Within four weeks, experience 82% visibly less dry lips, 94% less rough lips, 77% more supple lips, 77% better-looking lips. Use daily and see your lips transform within eight weeks where cells are completely renewed for reborn lips and lips’ natural moisture level is increased by four times. 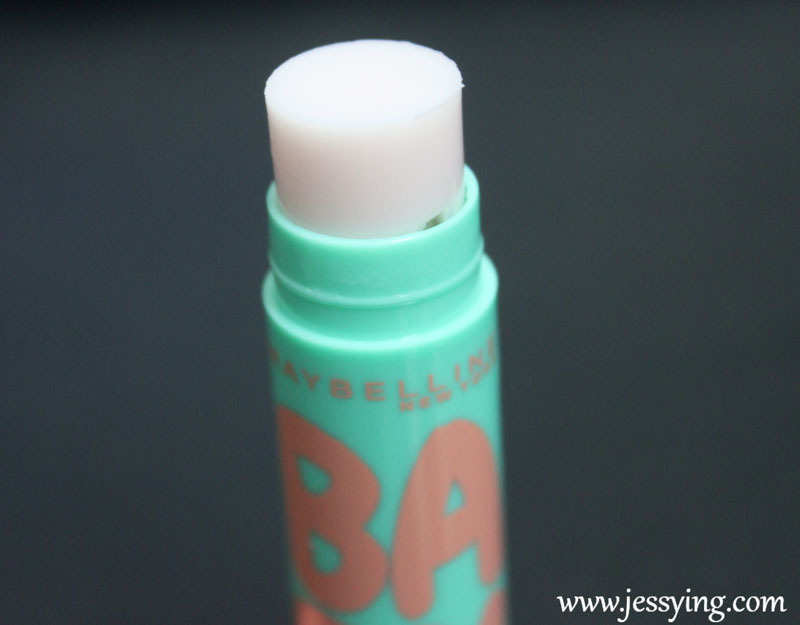 Dry lips are so over; soft baby lips are it from now on! If you looked carefully this lipbalm has a SPF20 which means it is only for day use and good protection against sun rays. A small herbaceous plant that is used in traditional African and Chinese medicine for centuries. Proven to combat ageing thanks to its very high anti-oxidant properties, Centella is gives Baby Lips this one-of-a-kind efficiency to deliver plumpness, hydration, replenished elasticity while stimulating natural collagen production for a line-free look. 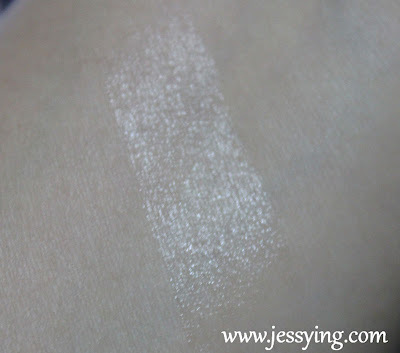 Maybelline New York’s exclusive formula for adult strength care. 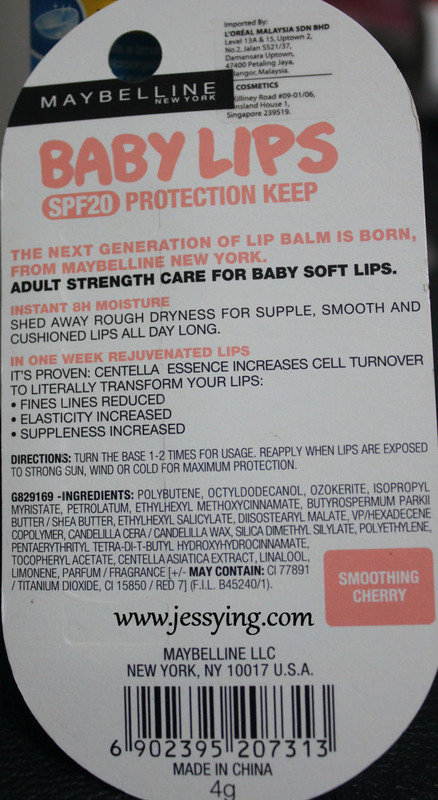 Lips are properly cared for so they become baby soft in just four weeks! Baby Lips is a combination of nature’s best ingredients – Shea Butter to repair and leave lips soft, moisturised and comfortable; Vitamin Complex packed with powerful anti-oxidants to prevent oxidation of lip molecules and restore damaged cells; and SPF20 for the ultimate protection from dangerous UV rays. Review : The first thing I noticed when I applied it on my lips is that it's heavily scented according to the lipbalm flavour you pick. 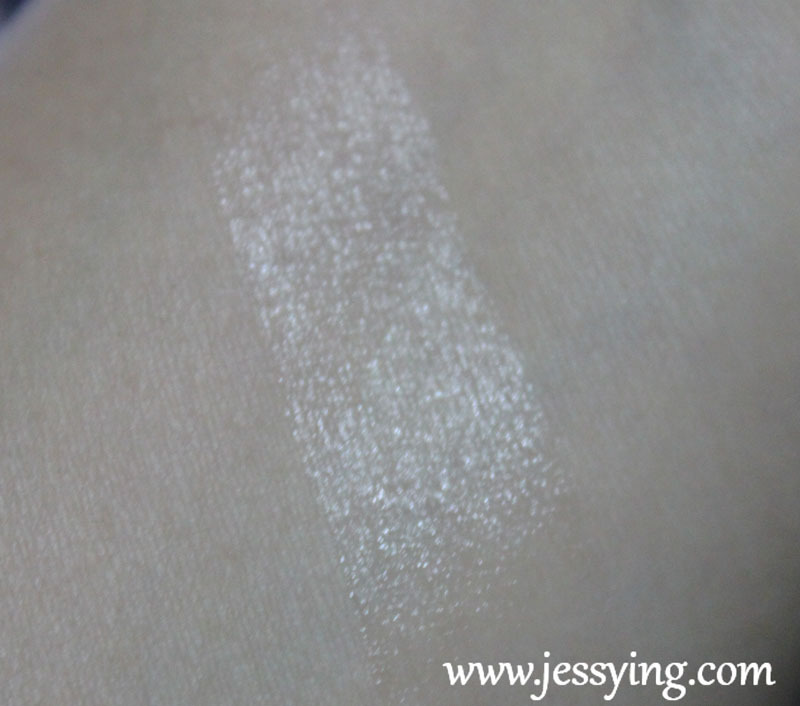 As expected the Maybelline New York Baby Lips gives smooth & easy application. It is light and not greasy. 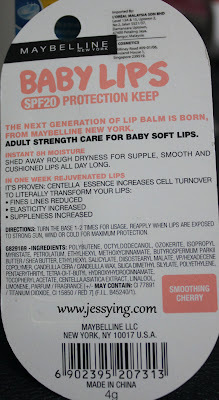 I keep my lips moisturise for for few hours before I need to re-apply it, love it because it has SPF 20. However the only thing I do not like about this lipbalm is the scent (i.e cherry) which is too strong for my liking. However I am not sure of the others flavour cause I gave the other away to family & friends to try and there seems no complain from them. Usually I prefer my lipbalm scent to be mild or just un-scented. wow you have so many.